At appitecture we bring you and your customer closer together. We've developed apps for the iPhone®, iPad® and the Android® using the latest in Geo-Social Marketing technologies. You control the content and the listing. Your business is listed, mapped, displayed directly to your client, or customer right on their smartphone, or tablet. appitecture provides you with a low-cost affordable way to deliver information about your business or service, list menus and special offers. 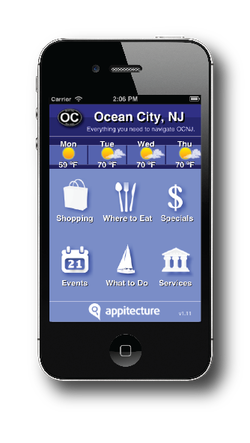 The app works like this, appitecture places a geo-fence – an imaginary boundary around a geographic location, like Ocean City, NJ. Then we provide the business with a free basic listing that includes business name, address, phone, directions through maps – not bad for free right? When you upgrade to one of our listing plans, you control your information and what you say about your business. We get you there in 4 easy steps. Sign in – Set up your secure username and password. Enter your details – Hours of operation, website address, etc. Upload you menus, or specials. You’re ready to be seen. That was easy...right! We have plans as low as $19.95 per month. We provide the listing for your business you decide how you want to promote your products with our easy to choose plans and payment options. Now your in control! Do you need a website, or landing page? appitecure can design and deploy your website so your customers can discover who you are and what you offer. That's not all, with our exclusive Merchant Card Services, our product offering can save you money on processing fees and equipment. Your security is assured because appitecture and its partners spend nearly one billion dollars in security protection annually. Our processing platform has been validated PCI, CISP, and SDP compliant, assuring you and your customers the highest security standards. Your business relies on communicating to your customers. We have a complete print portal that provides a solution for all your printing needs. From business cards to banners, we can produce what you need and deliver it on time and on budget. You can count on appitecture Print Services to support your printing projects.